This outstanding sketch by artist David Story includes some interesting notes he has made in the margin. 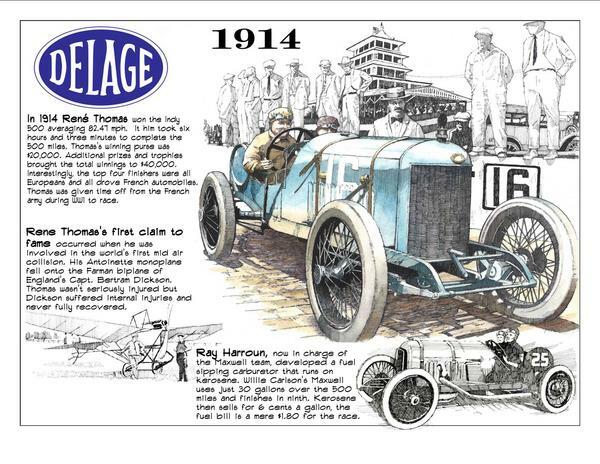 The art captures an image of 1914 Indianapolis 500 winner Rene Thomas and his Delage racer. This race marked the second year in a row that a European manufacturer, a French one, dominated America's new premiere race. This time it was Delage, which finished first and third with Albert Guyot driving the second entry. Adding to the French dominance Peugeot cars nailed down second and fourth places with Arthur Duray and 1913 Indianapolis 500 winner Jules Goux at the steering wheels, respectively. The first American driver across the finish line was Barney Oldfield in the Indianapolis-built Stutz - a distant fifth. As called out in David's margin notes Billy Carlson drove a unique entry with the kerosene fueled Maxwell sporting a special carburetor designed by Ray Harroun, the winner of the first Indianapolis 500 in 1911. Like many race drivers of the period Thomas was intrigued by and participated in pioneering aviation. For many of these mechanically inclined men anything powered by motors were a fascination they had to touch, tear apart and operate. Also noted in David's margin is a reference to one of Thomas' more harrowing experiences in his years flying - what has been called the world's first mid-air collision. He was a test pilot for the French Antoinette Company at the time. Despite Thomas' preoccupation with risky pursuits he was among the too few early racers who lived a long life. Born in 1886 he passed away in 1975 at age 89. Look for more sketches from David Story here in a special collaboration with First Super Speedway. 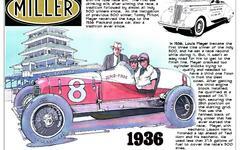 Take a look at his sketches of other Indianapolis 500 champions Joe Dawson, Jules Goux and Ray Harroun.